(12:15 a.m. AEST) -- Norwegian Jewel makes its maiden call to Australia on 12 November 2017 to start its first local season. 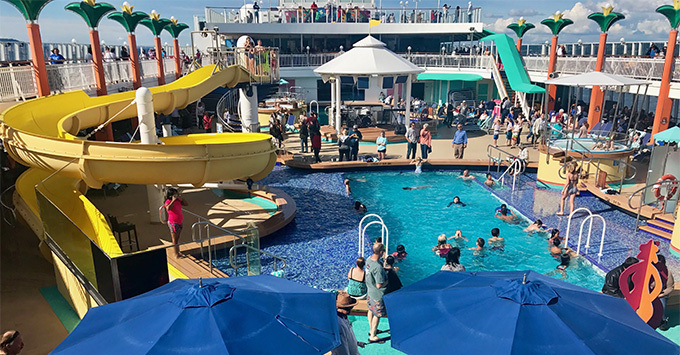 We hopped aboard in Alaska this week to sneak a preview of the 3,500-passenger, 12-year-old Norwegian Cruise Line ship. See below for our opinion of what will impress Aussie travellers -- and what probably won't. After a repositioning voyage from Vancouver via Hawaii and Tahiti, Norwegian Jewel will operate cruises round-trip from Sydney to Tasmania and New Zealand, as well as a regional getaway to Eden, Burnie and Kangaroo Island, before ending the summer with an 18-day journey to Singapore visiting Queensland, Darwin and Komodo Island. What would you think if you heard guitar playing and someone singing Sweet Child O'Mine at 7 a.m.? Some crazy party animals are still drunk from the night before? Wrong. It's just crewmembers at the buffet entrance cheering you up for breakfast. At lunch and dinner they invite you to "washy washy, happy happy" with the hand sanitiser. You can't help but smile every time. 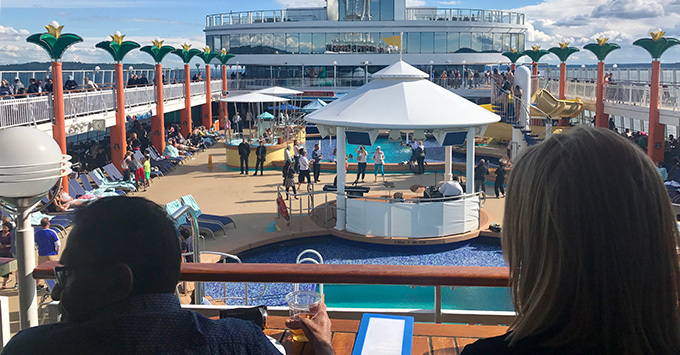 Rather than pay to do a tour of the bridge, where the captain and officers 'drive' the ship, Norwegian Jewel passengers can go up to a free observation area to watch them work. The bridge viewing room on Deck 11 is open to everyone all day and you can see all the way out the front windows to the horizon. 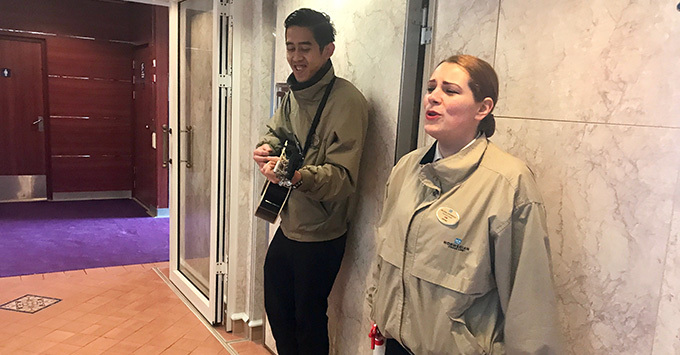 We've never seen this on a cruise ship before! Don't miss it. 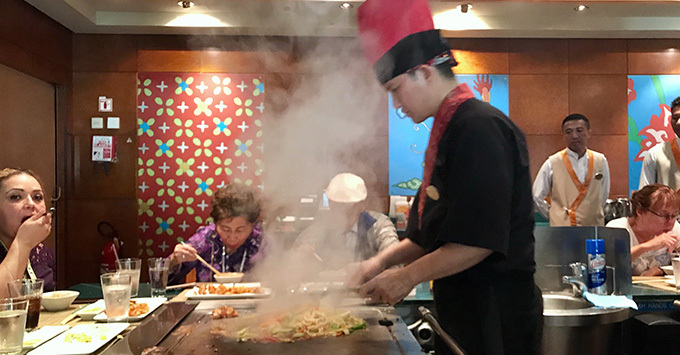 As much fun as you can have in a restaurant, Teppanyaki is a lively affair with lots of noisy knife-clanging, laughing and cheering. The room is divided into four communal tables surrounding hot plates with a chef stationed at each one. Our chef, Florencio from "Philly" (Philippines) was funnier than the comedians in the Stardust Theatre. Singing while he cooked, he performed tricks with the food and utensils and cracked jokes for an hour. The US$29.95 surcharge includes edamame, miso soup, seaweed salad, fried rice and your choice of meat, seafood or vegetarian mains plus dessert. The social atmosphere makes this venue a good choice for solo travellers as well as families, groups and couples. We also loved sitting at the bar watching the chefs make sushi and sashimi, ceviche and poke. It's worth getting a dining package and paying the US$7 upgrade for unlimited food here. If you like it spicy, order the dish with jalapenos -- delicious! The daily program is jam-packed. Instead of one activity at a time, there's four or five. The live music is good, the game shows are fun, and you can even meet the officers, the entertainment staff and more. (At the Newlyweds game show on our cruise, a couple who won The Bachelor in the US -- Sean and Catherine Lowe -- were contestants, which you don't see every day!) Expect the usual sports, lectures, trivia, arts and crafts, cooking demonstrations, shopping events, dancing and stretch classes. For a fee, you can do tastings of beer, wine, whiskey or martinis; go to Pilates, yoga or indoor cycling in the gym; or enter bingo, poker and blackjack tournaments. NCL is known for its exceptional Broadway-style productions and atmospheric venues on its newer ships. The older Jewel is not quite up to this high standard and the décor is dated. But the good news is that when it's in Australia, we will get to see the ballroom and Latin dance spectacular Burn the Floor. Other highlights were Le Cirque Bijou, Aussie singer Amy Edwards, comedian Rod Long and the White Hot Party (separated into family, teen and 18+ parties). We're double-checking the Australian 2017-18 plans with NCL but the current system is for a "service charge" to be added into your cruise fare price. If you choose to remove it at the time of booking, USD$13.99 per person per day (for passengers three years and older) or US$16.99 per person per day (for The Haven and suites) will be charged to your onboard account. Then there's the 18 percent tip for all drinks, spa and salon treatments and specialty restaurant bills. On top of pricing in US dollars, these extra fees add up quickly. Most of the room service food is free but incurs a "convenience charge" of US$7.95 per delivery (except for the complimentary continental breakfast). Norwegian Jewel's crew, especially waiters and cabin attendants, are fantastic but some look bored and barely acknowledged us. Perhaps they have strict instructions to stay within their allocated duties but it didn't make sense when we were the only passengers in sight, trying to get a bowl of icecream at Topsider's, and five bartenders stood around serving nobody, just looking at me and saying "the other guy is in charge of ice cream". So because "the other guy" was busy setting up the grill for lunch, we had to wait. Waiters on the pool deck also walked past without enquiring if we wanted anything -- the opposite of table service on other ships where you get asked every couple of minutes -- but it's probably a positive to not get hassled to buy drinks. Chin Chin has a complimentary selection of dumplings and noodle soups, which are OK but not amazing. Topsider's poolside burgers and hot dogs are good but apart from the freshly grilled beef patties and sausages, you have to make them yourself. There is a wonderful assortment of condiments including sauces, cheese, salad, tabouleh, chili con carne, macaroni cheese and jalapenos. Topsider's, O'Sheehan's and the Tsar main dining room are also open for breakfast if you want to avoid the crowds. Menus will change when Norwegian Jewel comes to Australia in November but we really hope they keep that holy guacamole.